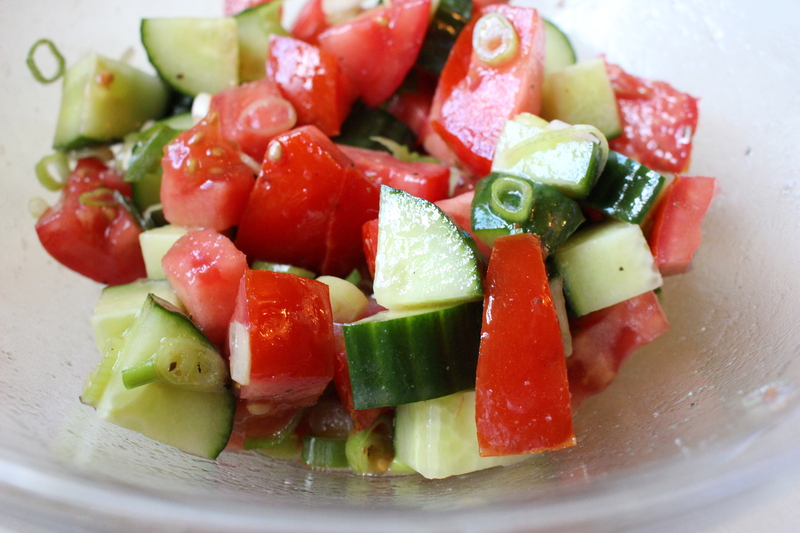 In a large bowl, combine the tomatoes, cucumber, and scallion. Drizzle over the vinaigrette and gently toss to combine – you can adjust the amount of dressing based on your personal preferences. Set the bowl aside for about 15 minutes to allow the favors to come together. Serve alongside your favorite grilled meats or pasta dishes. Hey, everyone! How are you? Are you loving summer as much as I am right now? This summer has been glorious food-wise and I have been taking HUGE advantage of the town’s farmer’s market each weekend. It not only serves as a good study break (T-minus 3 weeks until the big RD exam! 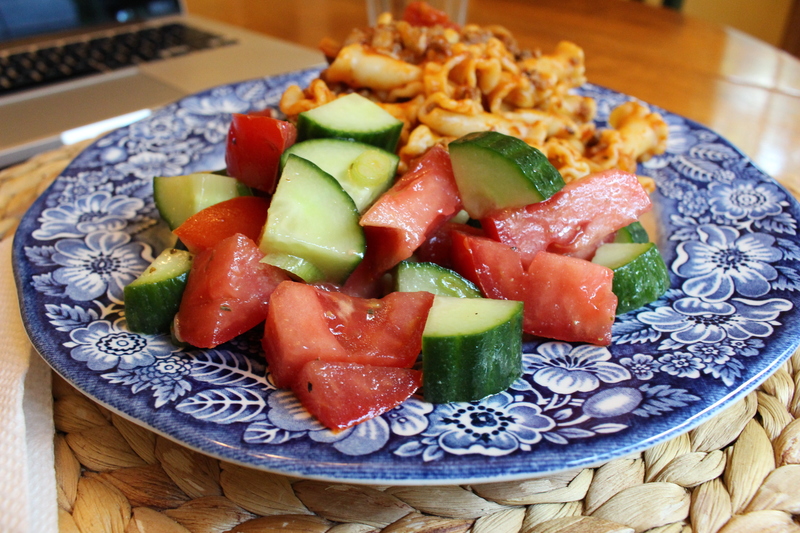 ), but also a great source of meal inspiration throughout the week. 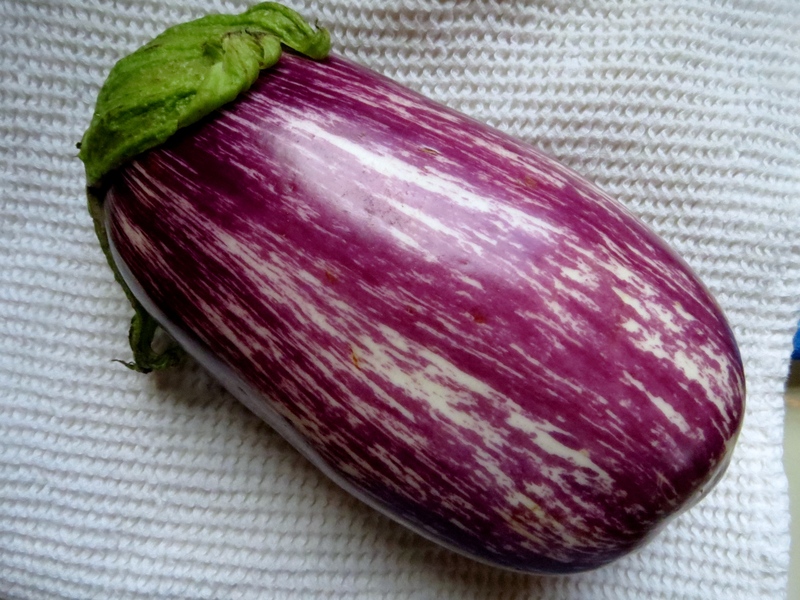 …and probably the most beautiful eggplant that I have ever seen in my life. It was screaming “BUY ME”, so I grabbed it and decided right then and there that I was going to grill it (the farmer who was bagging up my purchases agreed with me). I sliced up the most beautiful eggplant ever into thick rings (about ¾ of an inch thick) and then laid the slices in a colander and salted them with some kosher salt (about 1½ teaspoons for a medium-sized eggplant). This helps bring out the excess liquid in the eggplant and it also helps draw out the bitterness that eggplants are known for. After letting the eggplant sit for about 45 minutes, I gently rinsed off the salt and patted the eggplant dry. This method can be used not only for grilled eggplant, but eggplant that you are going to pan-saute, fry, or roast! Then I sprinkled on some olive oil, some more kosher salt, ground black pepper, and some fresh thyme leaves (totally optional). All that was left was to pop these babies on a hot grill and let them cook for about 4-5 minutes per side. Just what grilled eggplant should be – charred and smoky on the outside and soft on the inside! And no bitter taste, so this is a great veggie side dish to serve to your more veggie-adverse family members. They were delicious as a side for grilled steak and absolutely amazing as the star in this sandwich I whipped up with the leftovers (more on that later this week!). Hope you are having a great week, kiddos! 1. Slice the eggplant into ¾-inch slices (approximately 8-10 slices per eggplant). Lay the slices in a colander in a sink (or over a bowl) and salt the slices with 1½ teaspoons of kosher salt. Set the eggplant slices aside for 45 minutes to draw out the excess liquid and bitterness. Rinse the eggplant to remove the salt and pat it dry. 2. Coat the eggplant slices with the olive oil, 1 teaspoon of kosher salt, the black pepper, and the thyme leaves. Place the slices on a pre-heated grill (I heat my gas grill on medium-high heat) and cook the slices for 4-5 minutes per side or until they become slightly charred and have good grill marks. Serve the eggplant alongside your favorite main dishes or use as an addition to sandwiches, salads, or pasta! We are officially five days away until the official start of summer, but that doesn’t mean we haven’t been jumping the gun a little and pretending that it’s actually summer/making all our favorite cook-out foods! Memorial Day is the official start of the summer anyway, right? What I love about summertime eating is that it’s simple food that has big flavor and big appeal with family and friends. Hamburgers, hot dogs, big tossed salads, watermelon wedges, and various cold salads. As a foodie, I love big outdoor spreads that allow me to visit with friends and family and the ability to graze for hours. But fear not! Your park picnics and backyard soirees don’t have to be potato salad-free – just swap your traditional potato salad with an equally delicious (and much more picnic-stable) French Potato Salad. And it’s just as easy to make. This is my adaptation of Martha Stewart’s Potato Salad Vinaigrette from her “The Martha Stewart Cookbook”. It starts with some small new potatoes that have been boiled until fork tender and drained well. I’m using red new potatoes, but white new potatoes work too. Or, if you can find them, the tri-colored new potatoes (with awesome purple potatoes) are a fun twist. 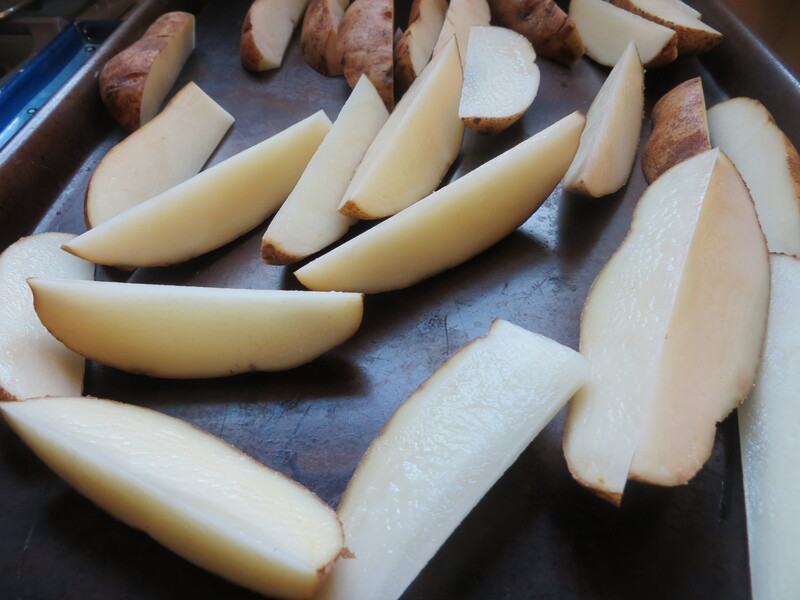 While the potatoes are still piping hot, carefully slice them in half (or in quarters if they are especially large). And then drizzle the hot potatoes with some good white wine. If you don’t like wine or want to serve this dish to the kiddos, you can totally leave this out! Then all that’s left is to whip up the dressing. In a container with a tight-fitting lid, add in olive oil, red wine vinegar, Dijon mustard, finely minced shallot, finely minced dill, salt, and pepper. Shake vigorously to combine. And pour over the potatoes. Toss everything together. And voila! Perfect French Potato Salad for your next picnic or backyard get-together. Long-live summertime eats! So, what’s your favorite outdoor dish? Let me know! 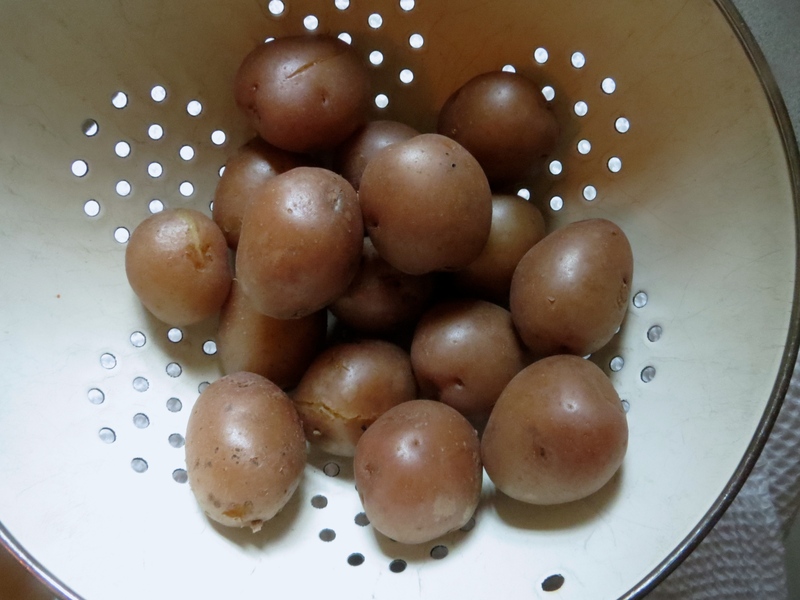 Place potatoes in a large pot and cover them with cold water. Bring potatoes to a boil and cook until they become fork tender but don’t start to break apart, about 8-10 minutes. Drain potatoes. Cut potatoes in half (or into quarters if they are larger) and place into a bowl. Drizzle potatoes with wine and toss gently to coat. Set aside. 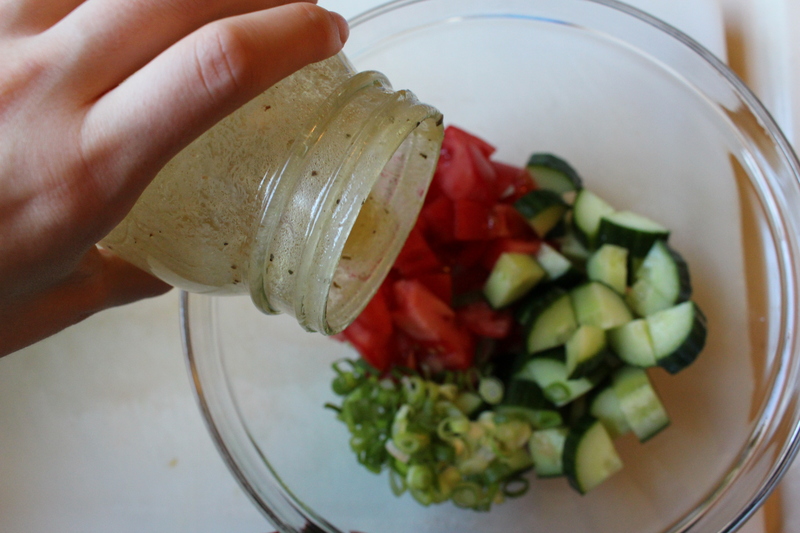 In a container with a tight fitting lid, combine olive oil, vinegar, Dijon mustard, shallot, dill, salt, and pepper. Shake vigorously to combine. Pour dressing over potatoes and toss to coat. Taste for seasoning and add additional salt/pepper as needed. Serve immediately or pop into the fridge and serve later (tastes great warm or cold!). Recipe lightly adapted from The Martha Stewart Cookbook by Martha Stewart. Yes, ladies and gentlemen, I am officially DONE with my dietetic internship. Who knew a year could fly by so fast? After all the excitement this weekend, we had a slow, relaxing day at home. When my mom asked me to make a dinner side, my relaxed aura was definitely not thrown for a loop – whipping up a dinner side dish was just as relaxing as sitting and watching TV because we had a stocked pantry and fridge. After gazing in my various food storage areas, I found snap peas, dried pasta, jarred pesto, and some grape tomatoes. Thus, Pantry Spring Pesto Pasta was born. It all starts with some snap peas. Snap peas are so quintessentially spring – perfectly green and crisp, just like a springtime afternoon. Plus they are an excellent source of vitamin C! For easier cooking/eating, I sliced them on the bias into smaller pieces (2-3 pieces per pea) and then set them aside as I started to cook the pasta. Toss in the cut snap peas with one minute left in the cooking time (please be careful!). When the pasta is al dente and the snap peas are just barely cooked and a vibrant shade of green, drain them very well. I used jarred pesto here, but fresh pesto would be just as lovely. Whatever you use, it will be delicious. Toss the pasta well to combine. I garnished mine with some grape tomatoes. They not only added a nice freshness to the dish but some much needed color! All that’s left it to serve it up alongside your favorite picnic favorites… or as a main vegetarian dish by itself! Options… they make the world go round! Fill a big pot with water and bring to a boil over high heat. When it reaches a boil, heavily salt the water and pour in the past – cook according to the package directions. 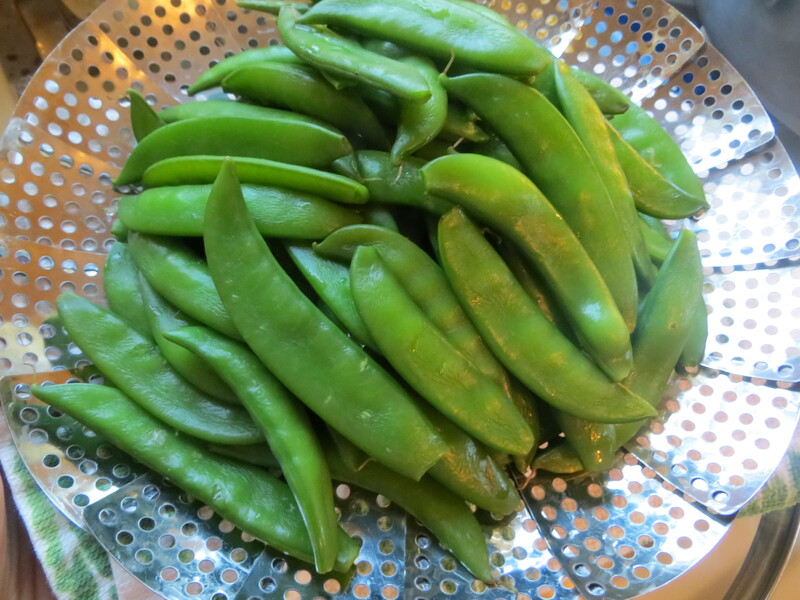 While the pasta is cooking, slice the sugar snap peas on the bias (2-3 pieces per pea). When there is one minute left in the pasta cooking time, add in the sugar snap peas. 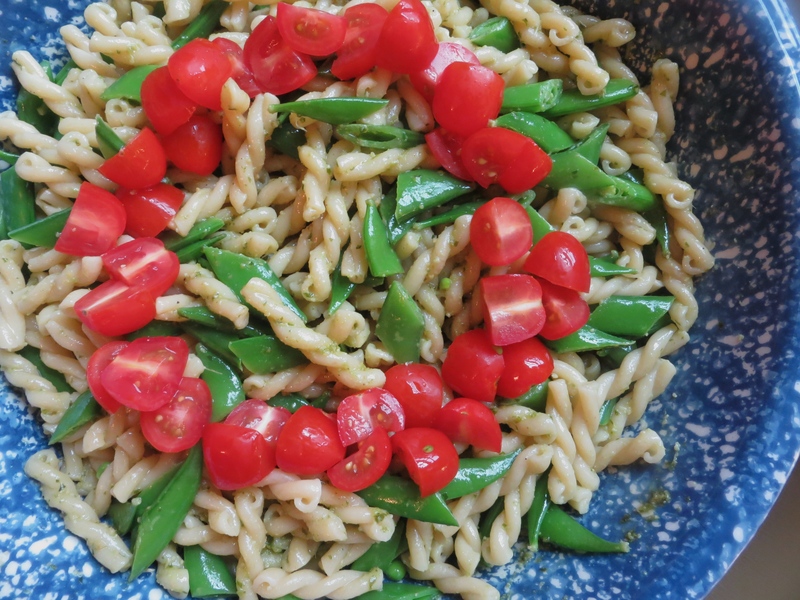 Cook for one additional minute until the pasta is al dente and the snap peas are just barely cooked and vibrant green. Drain pasta and peas well. Transfer the drained pasta and peas to a bowl and add in the pesto. Toss thoroughly to coat the pasta and peas. Garnish with the grape tomatoes. Serve alongside your picnic favorites. When you think of weekends, what do you think of? Breakfast potatoes are my favorite breakfast side… the crispy outside, creamy inside, the perfect saltiness that complements my brunch favorites. But I’m lazy… who has time to whip up breakfast potatoes when you can stay in bed and read food magazines? Not this girl. So roasted potatoes are the best solution to your lazy weekend morning inclinations. They are amazing hot from the oven as a dinner side, but also taste great re-heated the next day to go alongside your eggs! I have shared my recipe for Lemon Roasted Potatoes already on the blog, but these basic roasted potatoes make a better transition from dinner to breakfast (unless you like lemon in the morning – no judgement!). 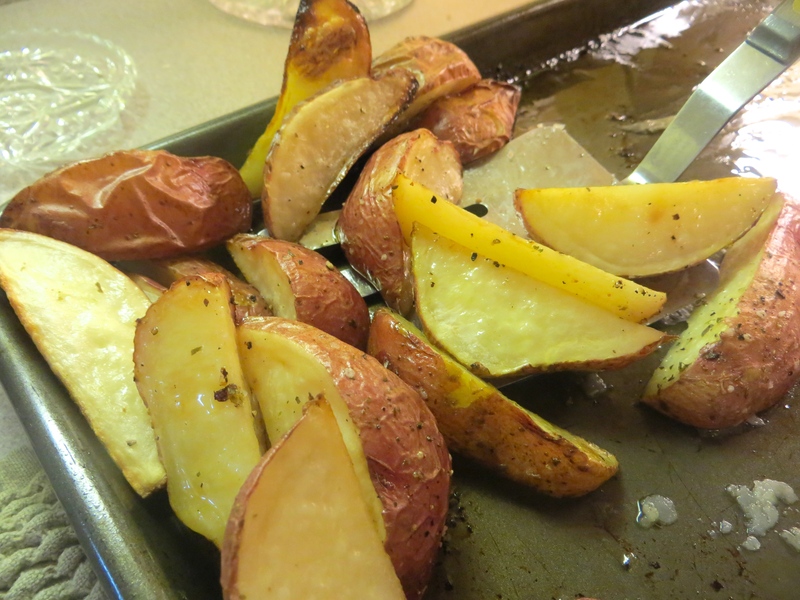 … and cut into wedges. They need to be super clean but I keep the skins on the potatoes not only for appearance but for a little extra fiber! Drizzle on some olive oil. And sprinkle on salt and pepper. Then pop the pan in the oven and roast at 375 degrees for 45-60 minutes. Until the potatoes are golden brown, crisp on the outside, and fork tender in the inside. All that’s left is to serve them alongside your favorite meal – breakfast, lunch, or dinner! Preheat your oven to 375°. Spray a rimmed cookie sheet with cooking spray. Cut the potatoes into six wedges, long-wise. 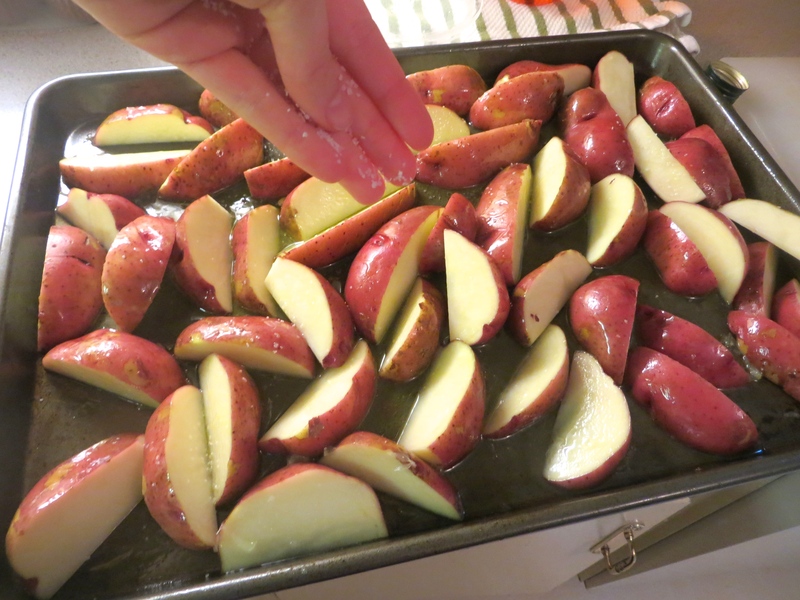 Spread the potatoes out on the greased cookie sheet. Drizzle the potatoes with olive oil and sprinkle them with salt and pepper. 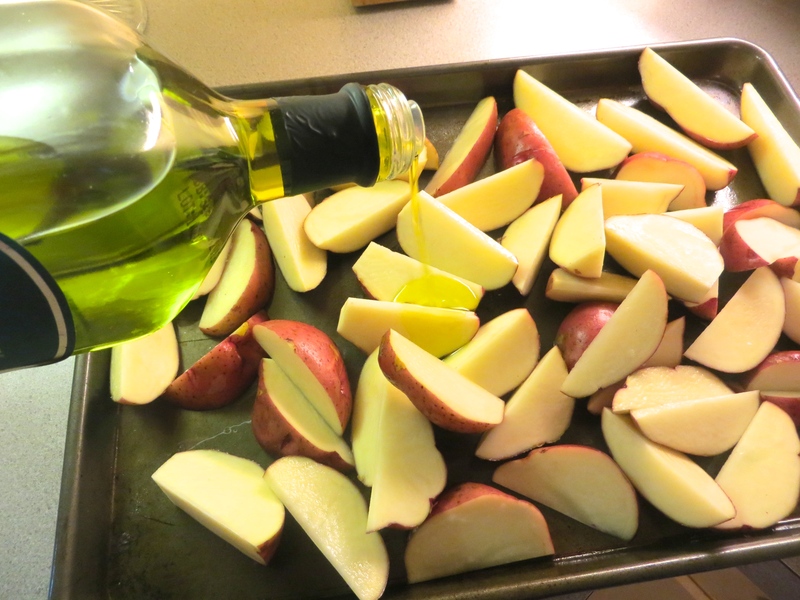 Toss the potatoes with your hands on the sheet to coat them evenly with the olive oil and seasonings. Bake for 45-60 minutes until the potatoes are golden brown and fork tender, tossing the potatoes halfway through. Serve alongside your favorite grilled and roasted meats, or your morning eggs. I really, really love vegetables. Kinda goes with the whole RD2Be thing. So when my mom made approximately five pounds of roasted vegetables this week, my heart soared and my stomach rejoiced (if internal organs were capable of emotions and thought). I love roasted vegetables. 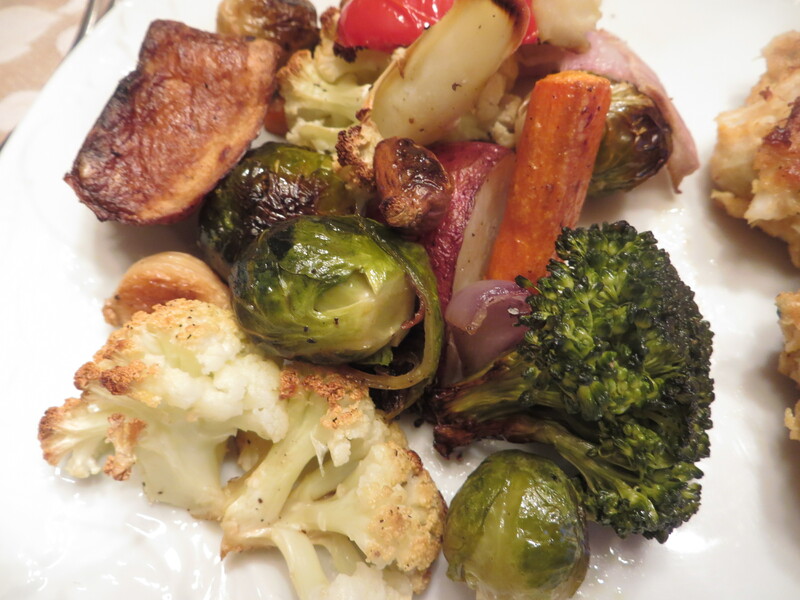 Roasting brings out the natural sweetness of the vegetables, making unpleasant vegetables (like the disliked Brussels sprout) delicious and appealing to the most stubborn vegetable hater. And roasting is super simple… chop, dump, roast, serve. Easy peasy! It starts with a whole load of veggies. Carrots, red bell pepper, cauliflower, Brussels sprouts, and red onion. We made enough to feed an army but you can use less veggies for a more normal portion (see the recipe below). 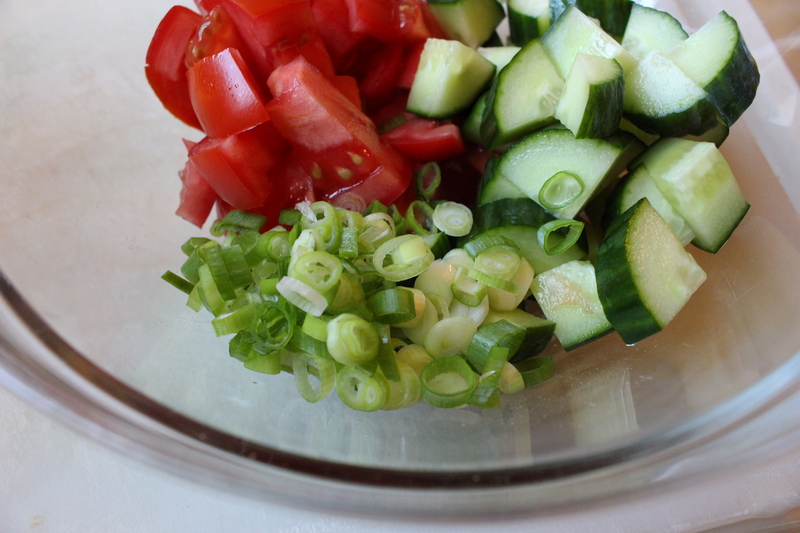 All you need to do is cut up the vegetables into equal sized chunks. And spread them out on rimmed baking sheets. 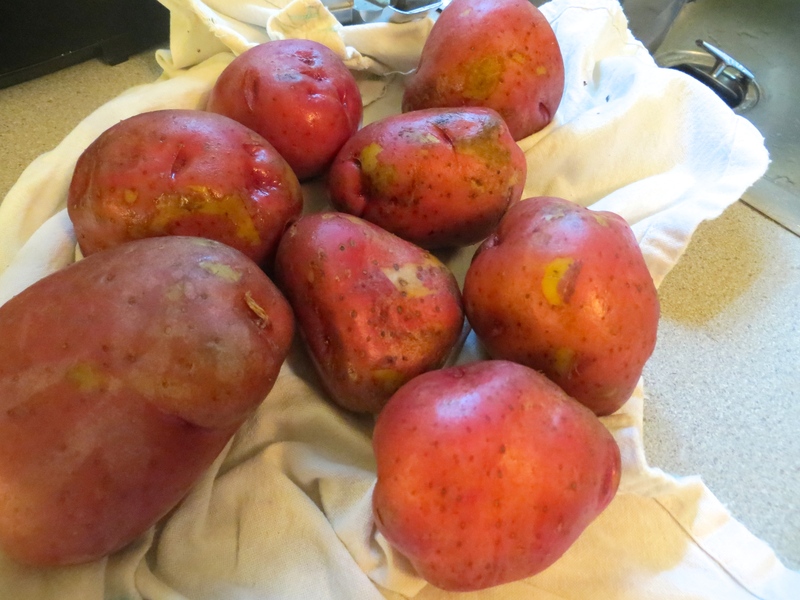 We tossed in some red potatoes as well so we had our starch and vegetable in one dish. Then, for a small delicious surprise, toss in a few peeled garlic cloves. They’ll roast along with the vegetables and become golden, soft, and DIVINE. Spread on some warm bread… food does not get any better than that. We decided last minute that we wanted EVEN MORE veggies in our roasted vegetables, so my mom tossed in some broccoli – it added a nice amount of green to the dish! Sprinkle on some kosher salt and some cracked black pepper and then pop the cookie sheets into the oven and roast at 400 degrees for approximately 40 minutes, or until the vegetables are brown and tender. Psst… the best part are the crispy Brussels sprout leaves that are on the bottom of the pan – make sure to nab them before your family does! Now it’s all about how you want to serve them. We just piled the veggies onto a platter and dug in. Or you can place them in a whole wheat wrap with a little hummus and have a quick, easy, and delightful lunch! Or mix into warm pasta and drizzle with a little olive oil. Or toss with orzo to make a cold pasta salad. I hope you enjoy this delicious vegetable recipe! 1. Preheat oven to 400 degrees. Grease a high-sided cookie sheet with non-stick cooking spray. 2. 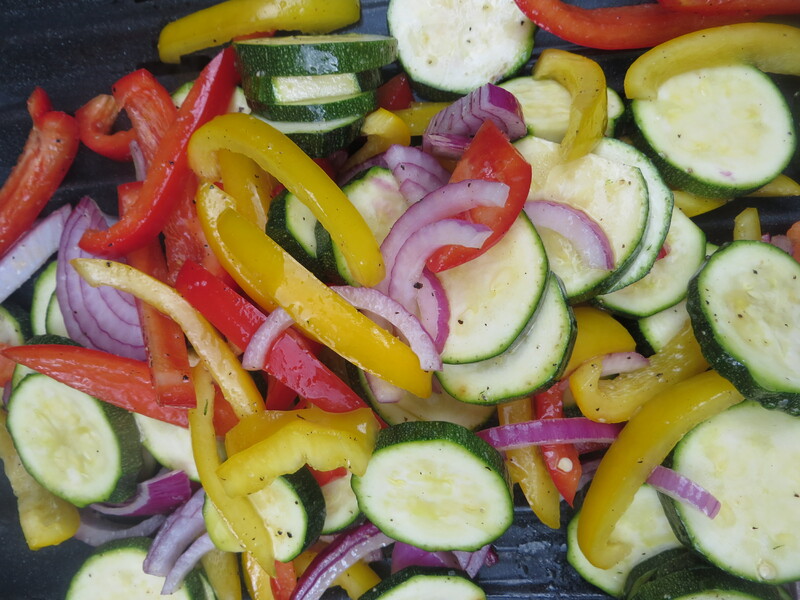 Place all the vegetables onto the cookie sheet and drizzle with olive oil and sprinkle with salt and pepper. 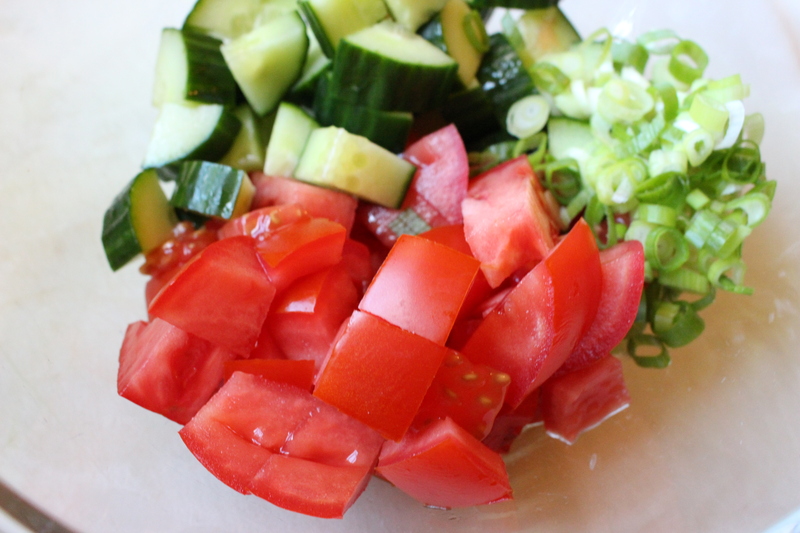 Toss vegetables to coat and arrange them into one flat layer. 3. Place cookie sheet into the oven and bake for 40 minutes, or until the vegetables become tender and brown. Serve as a side or as an addition to wraps, sandwiches, pastas, etc. Who loves sugar snap peas? Sugar snap peas are a magical vegetable. A perfect shade of green, delightfully crisp, and chock full of vitamin C. If I’m not careful, I can polish off a one-pound bag in an afternoon… It may be my favorite vegetable of all time (at least right now!). But what makes sugar snap peas so great is that they stand up to cooking and retain that bright, crisp texture. And nothing showcases my favorite vegetable like this quick and easy stir fry. It starts with some steamed or blanched sugar snap peas. They are cooked until they are just starting to become tender and very bright green! Like springtime! Resist the urge to snack on them while you continue with the recipe. … and throw in some thinly sliced garlic and red pepper flake. When they become fragrant, add in the sugar snap peas. Again, resist the urge to snack on the peas while you toss them together with the garlic/red pepper flakes. Now we build the sauce. Add in chicken or vegetable stock, some granulated sugar, and some low-sodium soy sauce (which also has a spring green label… can you tell that I’m totally over winter?). Then pour in a cornstarch slurry (cornstarch + water). Please excuse the pale, alien-esque hand photo… but this is real life, man! The finishing touch is a sprinkling of scallions. Toss and serve alongside your favorite broiled meat! In a deep-sided skillet, heat olive oil over medium heat. Add in the garlic and red pepper flake and cook until fragrant, about 1 minute. Add in the sugar snap peas and continue to cook for 1-2 minutes. Add in broth, soy sauce, and sugar and mix together – bring just to a boil. Gently pour in the cornstarch slurry and mix until the sauce forms. Top the sugar snap peas with the scallions and serve immediately! I love kale in a variety of dishes (like my Tuscan Winter Vegetable Quinoa Salad), but I think it truly shines in a simple sauté with garlic and hot pepper. And it couldn’t be easier. Especially when you use pre-chopped kale. My mom grabs a big bag of the stuff when she goes to the grocery store, so all you need to do is rinse it thoroughly. It makes this easy dish so much quicker! 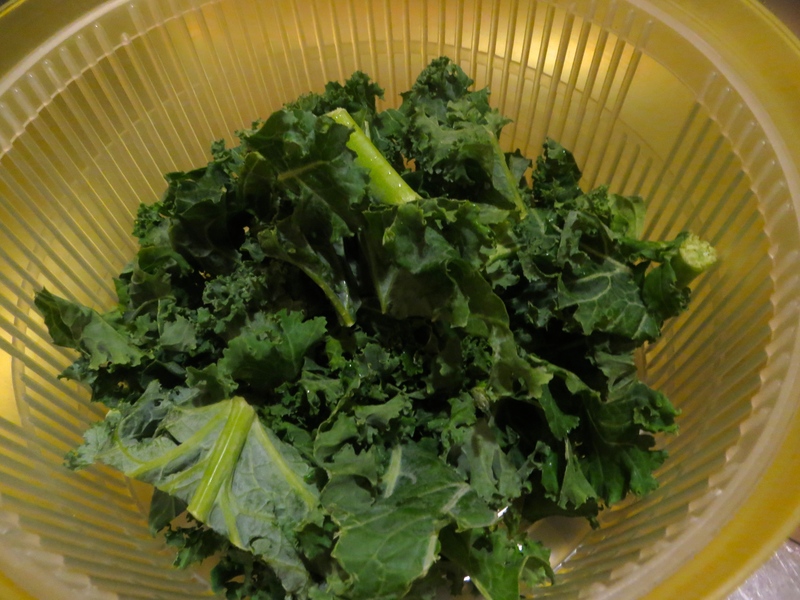 If you do not have pre-chopped kale, grab some kale, strip the leaves off the stems, and roughly chop it into bite-sized pieces. Then wash it thoroughly. One (small) extra step, same result. Easy, peasy. I used four (okay, five) little cloves, which works out to about 2 regular-sized cloves. And mince them up nice and finely, so you get all the wonderful garlic flavor without biting into huge pieces of raw-ish garlic. Toss the kale into a large skillet with a little bit of olive oil. And add in the garlic, some salt and pepper, and some hot pepper flake (if you like a little heat like me). All that’s left is to toss everything together and cook the kale until it’s wilted and delicious. Then pile onto a plate. What a simple (and delicious) way to eat your veggies! When the oil is hot, add in the kale and stir around for about 30 seconds. Add in the garlic, salt, pepper, and red pepper flakes. Continue to sauté the kale it becomes wilted and soft, about 3-5 minutes. Serve immediately alongside your favorite dishes. My sister, E, has gotten a job. Which means that in a matter of days, she’ll be leaving the nest for one of her own. Which makes me sad. It also means that our house has been turned inside out, upside down, with things emerging from deep inside closets to be placed into either suitcases, donation bags, or the garbage. In this spirit of organization, I decided to clean out my camera to prepare for the fall and the start of my internship. 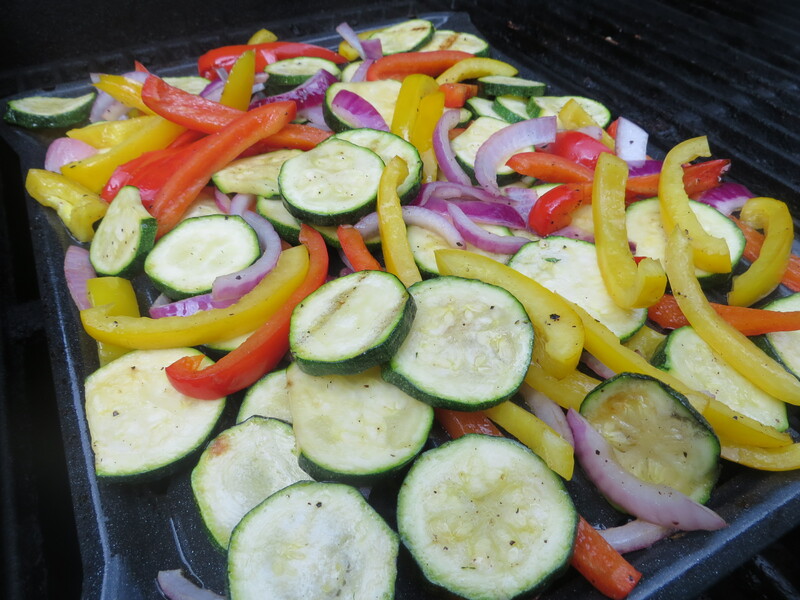 And I found photos for Grilled Summer Vegetables – a recipe that I was going to share BEFORE the 4th of July. Whoops. Summer vegetables truly shine on the grill, lending that smoky charred flavor to salads, pasta, and sandwiches. They are a super quick, easy, and fun way to get veggies into your kids (or some vegetable-shy adults). And this is really not a recipe at all. It’s more of a toss-throw-and-go kind of thing. 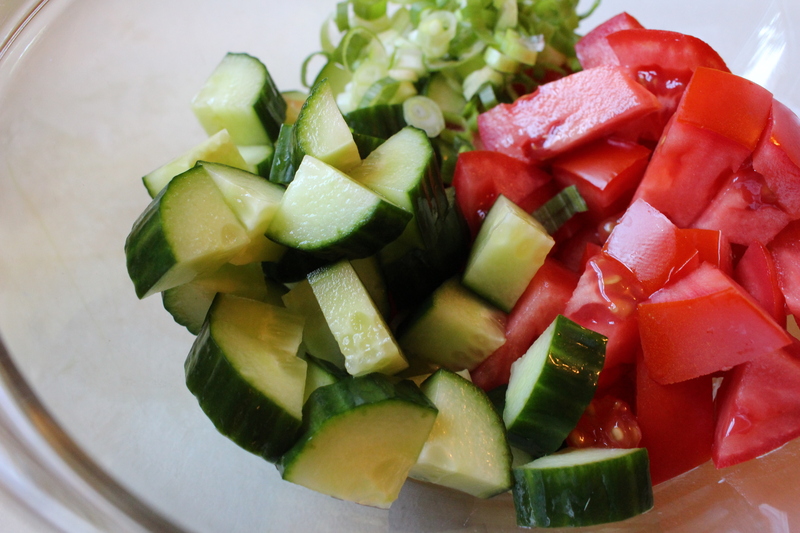 First, toss some cut up summer vegetables into a big bowl and coat with olive oil, salt, and pepper. I used a combination of zucchini, red bell pepper, yellow bell pepper, and red onion, all of which were reaching the end of their shelf lives in my fridge. This is a good way of using up leftover fresh vegetables – the grill really gives them a new, fresh texture. To grill the vegetables, I would recommend using some sort of grill pan or basket. Despite being cut into fairly large pieces, these vegetables can still slip in between the grill grates. We have a lovely grill pan, which someone left on the grill over the winter and it rusted (my bad…). So I compromised and grabbed the rack that came with our broiler pan for our oven. It worked fairly well, but it didn’t char the veggies as well as I wanted. With the grill pan screaming hot, carefully pour the veggies onto it (please watch your fingers!!). Make sure everything is spread out evenly over the surface. Look how pretty all those colors are. Every five minutes or so, turn the vegetables with tongs. This ensures that all sides of the vegetables can touch the grill pan and get nice and charred. These are all done – tender with a nice smoky flavor. They would be more charred if they were cooked in a grill pan, but they were delicious nonetheless! Load these vegetables on top of mixed greens with pecans, strawberries, and grilled chicken, wrapped up with hummus in a whole wheat pita, or mixed into pasta for a quick pasta dinner. Preheat grill pan over a medium-high heat grill. 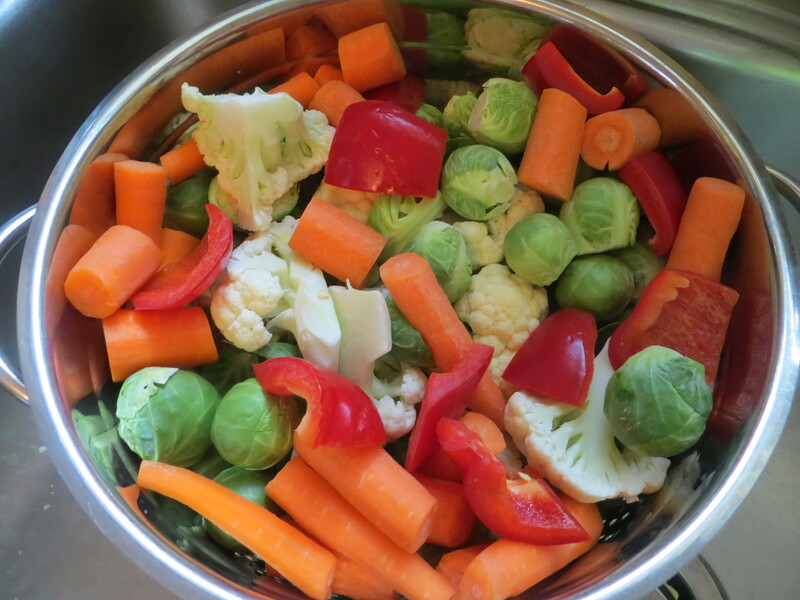 In a large bowl, combine the vegetables, olive oil, salt, and pepper – mix thoroughly to combine. Place vegetables onto the grill pan. Cook on the grill, tossing every 3-5 minutes, until the vegetables are tender and slightly charred. Serve warm. Hi, all! Can you believe that it is August 2nd (WHERE DID THE SUMMER GO?!)? As you can see, neither can I… which makes me feel SUPER unprepared for starting my dietetic internship in a couple of weeks, despite diligently doing my prep work, setting up my filing system, filling out the proper paperwork, and picking out the best first day outfit ever. Every time I begin to feel a little anxious, I pull on my apron and cook/bake up something delicious. And nothing says comfort and love like potatoes. I know that potatoes have gotten a bad reputation as being unhealthy and if you eat them, you’ll gain weight. Many people don’t realize that potatoes (with the skin on) are actually packed with good fiber, potassium, calcium, B-vitamins, and vitamin C. So don’t be scared of the potato, people! My favorite preparation for potatoes is roasting them… I love how the inside become soft while the exterior becomes crunchy and golden. 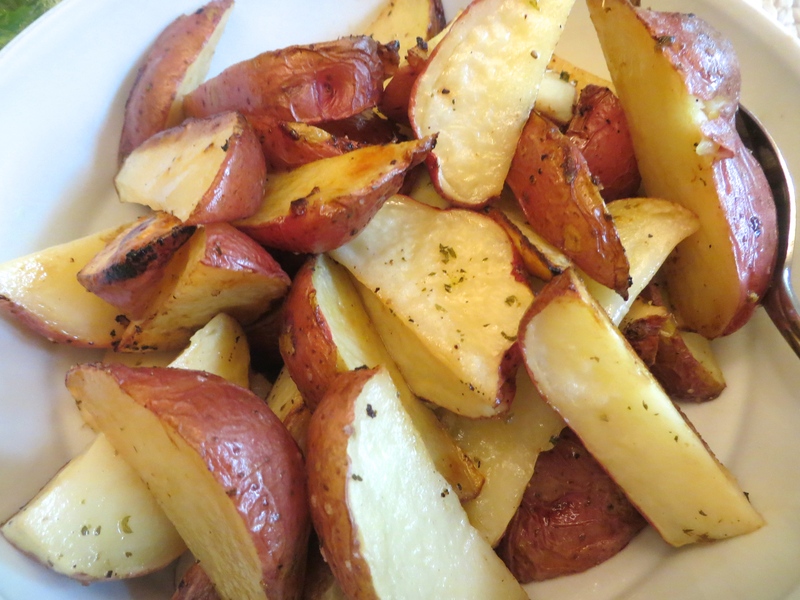 I update plain roasted potatoes with lemon for a Greek twist on an old classic. So grab yourself some potatoes. 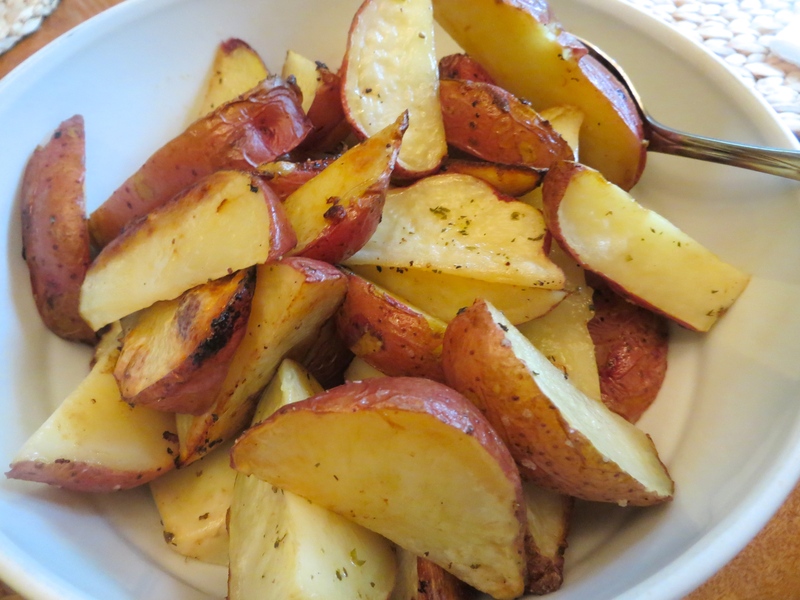 I am using red potatoes but Yukon Gold potatoes work perfectly here! 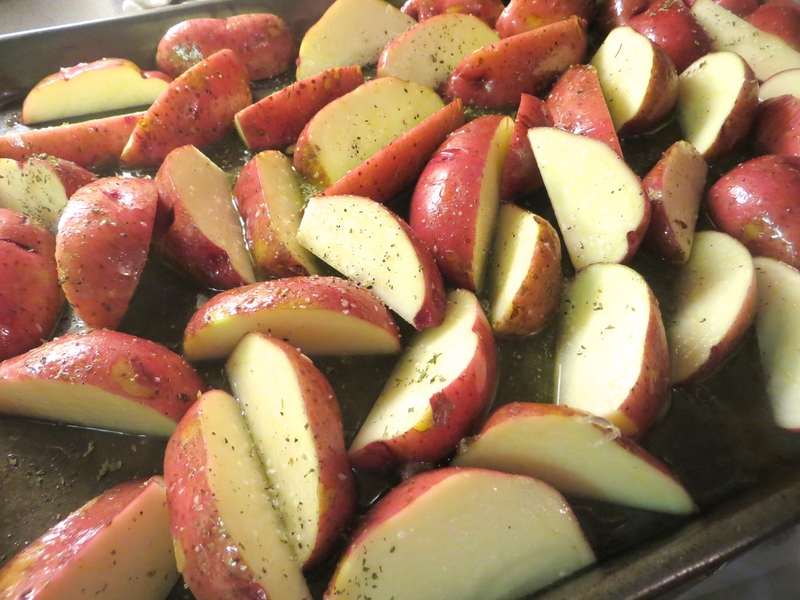 I usually allot 1-2 red potatoes per person or one large Yukon Gold per person. If you have leftovers, they are perfect cold in salads or heated in a skillet alongside your morning eggs. Cut the potatoes into wedges (I cut them in half and then cut each half into thirds, long-ways). And place on a cookie sheet sprayed with non-stick cooking spray. Drizzle with a good amount of olive oil. 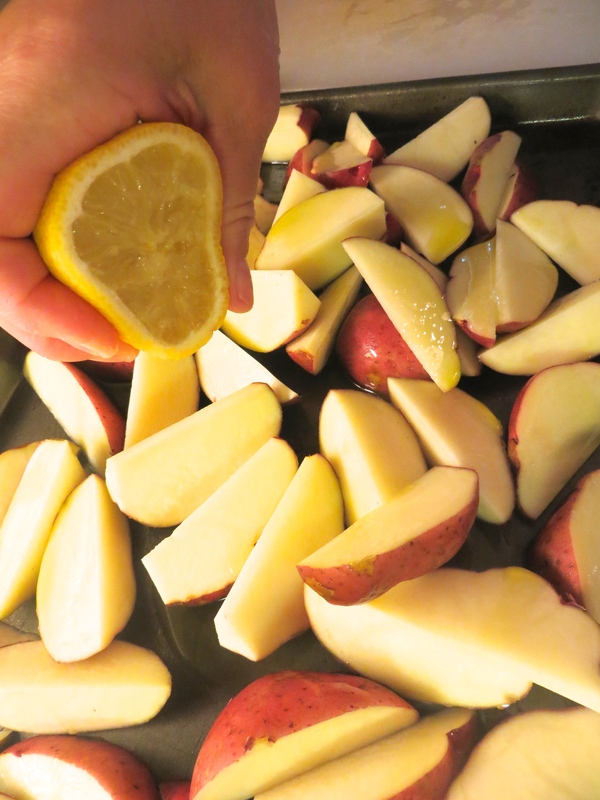 Squeeze the juice of one lemon over the potatoes. Then sprinkle them with plenty of kosher salt, pepper, and dried oregano. Toss to combine, then spread into one layer on the cookie sheet with one of the cut sides facing down. Roast at 410° for approximately 40-45 minutes or until they are golden brown and a knife is inserted easily into the potatoes. They are the perfect side for any roasted or grilled meat, a potato side next to some eggs, or out of the fridge at midnight. 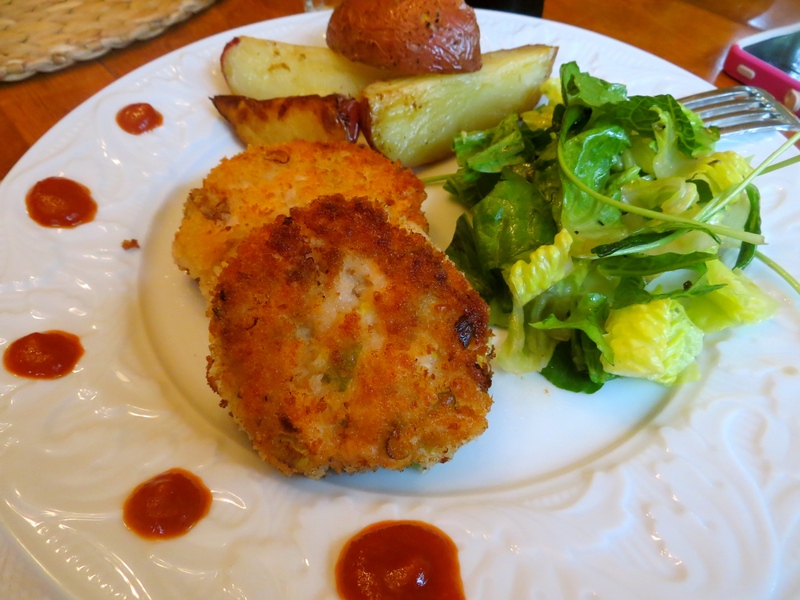 They also go really well with salmon cakes. 1. Preheat your oven to 410°. 2. Cut potatoes into wedges – cut potato in half and each half into thirds length-wise – and place on a cookie sheet sprayed with non-stick cooking spray. 3. Pour olive oil and lemon juice over potatoes. Sprinkle with salt, pepper, and dried oregano. Toss with your hands. 4. Arrange potatoes into one layer with the cut side down. Place in the preheated oven and bake for approximately 40-45 minutes, or until a knife is inserted easily into the potatoes. 5. Serve immediately or at room temperature.